This distinctive chime is tuned to sound like the ringing of distant bells. The inspiration for this chime comes from the Arts and Crafts architects of the mid 20th century. This influence extends to the clear tones of the square tubes and its tuning, which is based on the golden ratio. 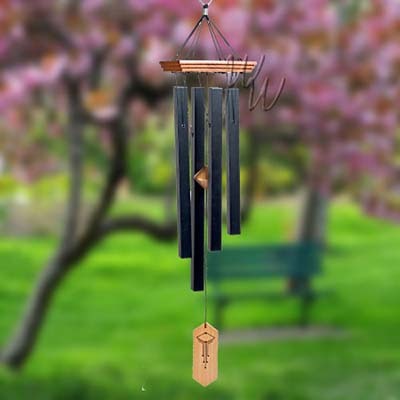 The inspiration for this chime comes from the Arts and Crafts architects of the mid 20th century. This influence extends to the clear tones of the square tubes and its tuning, which is based on the golden ratio. Made of: Ash wood, 4 satin black square tubes.